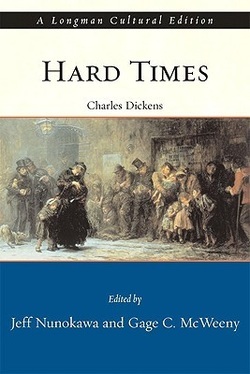 The cover said that this is Dickens most political work and is based in the fictional northern location called Coketown. A dirty, noisy factory town. Similar in style to David Copperfield but not as epic. Dickens characters always seem to defined and larger than life. Stephen Blackpool makes a great "hero"
I fell in love with the staircase metaphor, its use and repetition. Genius. Begins with Dickens explaining about Mr Gradgrind's beliefs of education based only on facts and the effect this has on his children Tom and Louise. Emotion and creativity being completely forbidden. A girl from the circus Cissy goes to the school Mr Gradgrind founded before her dad runs away and leaves her to be brought up by Mr Gradgrind. Cissy shows the contrast of Louise. Common sense v facts. Cissy becomes a servant for the family. Self made banker Mr Bounderby (very irritating) has designs on Louise from early age much to the obvious displeasure of Louise and does a deal with her dad for them to marry. Tom now employed by him helps persuade Louise to help his career. Mrs Sparsit is his elderly housekeeper as she came from an old money household and fallen on hard times. Devoted to his well being she dissaproves of the marriage. Steven Blackpool is an experienced factory worker who sees Mr Bounderby to ask for advice about how to divorce his alcoholic wife who is destitute. He is told only people with money or connections can divorce and is warned about marriage. Enter rogue James Harthouse to the bank who Dickens tells us is no good and warns of bad times to come. He befriends Tom who from now on is referred to as "The Whelp" as we learn about his drinking, gambling, poor work and abuses his sisters position. Robbing of bank Tom the obvious culprit but Steven Blackpool taking blame. Mrs Sparsits staircase metaphor as Louisa falls for Mr Harthouse. Follows him to secret meeting in rain with Louisa who is running to her childhood home. Mr Bounderby gives 24 hour decision time and then divorces Louisa. Mrs Sparsit tracks down the old lady and in a public audience at his house she is revealed as his mum and his humble background shown to be all lies. Cissy tells The Whelp to runaway and the circus help him. Mr Gradgrind clears Steven and travels to Liverpool to meet his son at circus and arranges for him to leave to America. Bank assistant tries to stop the escape but fails.